One of the things we're doing differently this summer is a focus on data & data analysis--it's an element of just about everything we do. It started with an introduction to plotting height-to-hand-width ratios on Orientation Day... now, the students are learning to track a few data points that are more personally significant. 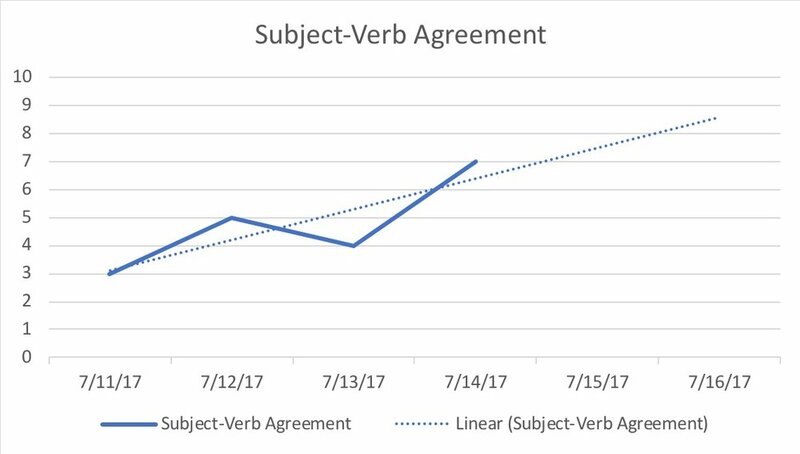 Let's say that in ELA, during the first week, we're assessing students on Subject-Verb Agreement (the assessment points are much richer than that, as you'll see at your boy's Student Led Conference, but it's a serviceable hypothetical). He takes a quiz (we call them 'Exit Tickets') at the end of class everyday, which enables his teacher to get a sense of where he's at in near-realtime. On day one, Student X gets a 3 out of 10. On day two, he goes 5/10--and he's feeling a bit better. Day three--maybe he didn't sleep so well--he submits 4 out of 10 right answers. In preparation for the fourth & final day (remember our weekly field trips! ), he's buckled down and gets his tally up to 7 out of 10 for the day. Now: imagine the same student coming into a classroom, having lessons delivered at him for four days, and then taking a quiz on which he gets a 70%. That's demoralizing & discouraging, and students tend to then disengage further from the material and the class. Here's the thing: it's the same information--the standard still matters, and 7/10 is not 10/10--but the student's relationship to the information is radically different; in both cases, he arrives at the end of the week knowing he's still got real ground to cover (no one is pretending that a 70% will get you into the kind of selective college from which more students graduate debt-free, and in four years' time). The difference is: he's shown himself that he is already making progress toward that goal. That's the basic idea, at any rate. Tune in at the end of Prep@Collegiate, when we translate this to the context of standardized tests. And, of course, don't take our word for any of it... just ask your boy. Older PostClasses are Underway--and P@C Boys Dive In!